Sleek, compact and portable. 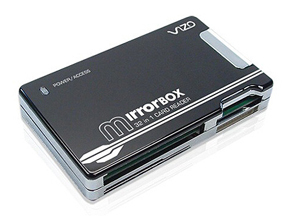 VIZO MirrorBOX 32-in-1 Card Reader is extremely versatile for your personal or business use. Support 32 of the most popular memory cards . USB powered device with low power consumption and no external power required. Plus, it is small enough to fit in your pocket. It is great convenient of you to bring it to anywhere for storing, downloading and sharing data between your computer, memory cards or external devices.